The curse is Broken. Item #12 is DONE. Yahoo! 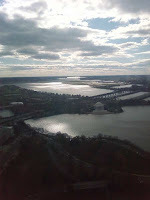 So I finally got a chance to go to the top of the Washington Monument. I ordered a ticket late yesterday afternoon on a whim and decided I would try to make it happen---again! If you read my previous blog about this, you know that something ALWAYS seems to happen whenever I try to go. After a little wait and a little small talk with some of the tourists I got to go up. The ride up was crowded...ack! The woman next to me was clausterphobic but managed to hold it together until the ride was over. All I could say when I got out on the observation deck is wow! Now some facts...the Monument is 555 feet high, which is small in comparison to say Sears Tower or the Empire State building etc etc. However, the views are fantastic. From the top you can see the bridges crisscrossing the Potomac into Maryland and Virginia. 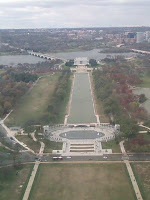 You get spectacular views of landmark DC buildings and the entire Mall including the Capitol Building, Lincoln Memorial, Reflecting Pool and Vietnam Wall. I was actually impressed. I mean it's one thing to live in a city your whole life and another to see it from a complete ly new point of view--especially DC. 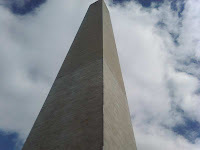 Unless you've been here, a lot of people don't realize we don't have any major tall buildings here--actually the Monument IS the largest building here because there is a law preventing any building within DC from being taller than the Monument. So, I have a new appreciation now for the bird's eye view. Plus if you really think about it, a lot of people--no matter where they live don't really take the time to play tourist in their own city (unless you get the out of town relatives that visit). In any case, I spent about a half hour walking around looking at each of the viewing windows. My cam phone took some surprisingly great pics. Afterwards on the way down the National Park Service Guide had another nice little surprise I hadn't known about. The windows in the elevator are frosted so you can't see anything as you go up, but on the way down, at two points the windows go clear and the elevator slows so you can see stones and wall plates donated from different states and organizations (like masons and fraternal orders)...well you learn something new everyday! 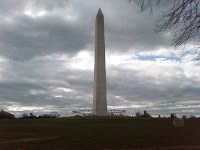 So, now I can finally say I've done the Washington Monument!